International Supporters of SHARPS | Stop Samsung - No More Deaths! A new petition has been created by international supporters of SAMSUNG electronics worker-victims. The text is below. Over the past two decades, Samsung has become one of the most dominant electronics companies in the world, and is now a global leader in semiconductors, flat panel displays, mobile phones, and television production. Sadly, this rapid rise to global dominance has come with serious consequences for the workers who produce the products – recent reports indicate that about 100 workers – mostly young women – have been stricken with cancer – mostly blood cancers – and at least 30 of them have died – making this the one of the largest known electronics cancer clusters in the world. (See http://tinyurl.com/2bl5c8a for more information). Samsung has denied all responsibility for these illnesses and the Korean government has declined to declare the cancers “work related” and refuses to disclose results of its investigation of Samsung. In response, a strong support movement led by the victims and their families has emerged in Korea and around the world and is seeking justice for those who have suffered from occupational illness. •The South Korean government should assure fair compensation for all of the victims and insist that Samsung accept responsibility for its actions. and campaigns with labor unions and grassroots organizations of workers. stress-related physical and mental health problems, to chemical exposures. oriented action, and the development of worker expertise and leadership. among young workers in Samsung plants in Korea. Unionists and activists from Communication Workers of America, the Santa Clara Central Labor Council, San Jose State University, Santa Clara University, and the San Jose Peace and Justice Center leafletted outside the Samsung factory in San Jose on May 25 – workers were receptive and interested and some even knew already about what was happening in Korea. An impressive display of solidarity linking the US and Asia! Samsung cannot hide forever from victims demanding justice. 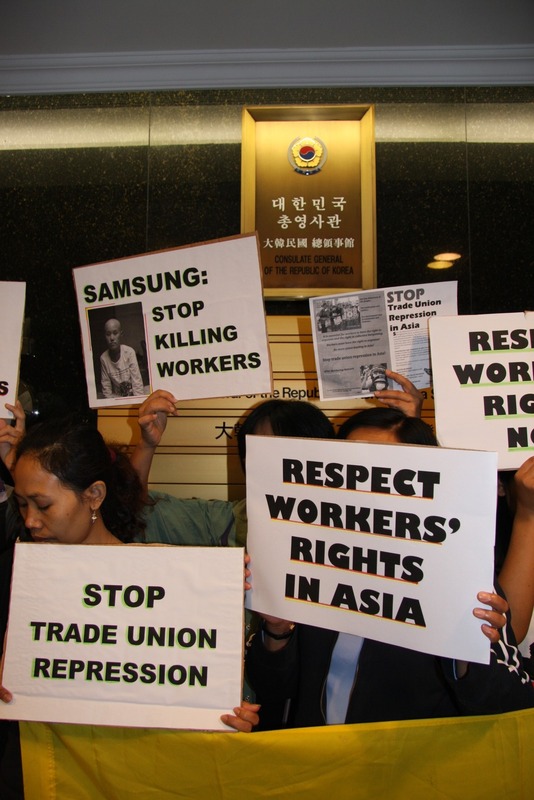 Every word and action that calls on the Samsung corporation and Korean government to protect workers and compensate for their work-induced illnesses will give strong encouragement to the workers and hasten the day of justice for the victims! 1) take a picture containing any kind of symbol of Samsung and send a protest message to either this government or Samsung. There are so many symbols of Samsung around. People could take a picture of the company logo from their possessions and the street. Among them, our recommendation is the Samsung headquarter building or their service center named “Samsung Digital Plaza”. Once people take a picture, we will suggest them to send the picture to SHARPS or to upload the picture at our website by themselves. We will collect all the pictures and use them for our publicity actions, for example, an exhibition at May day rally or Ji-yeon’s memorial event, or a photo stories at our blog or our news letter. I think people can find out the logo of Samsung easily at any country. Of course it will be great If people can make a protest rally in front of Korean embassy or huge factory of Samsung, but very small symbol will be okay too. Because even only one person can participate this kind of solidarity action. 2) Make your action on May 18 – May 18th will be the 49th day from the day of Ji-yeon’s death. People believe this service can help the dead go to the heaven not to the hell, and make “the future life” better.